Aaron uses soap and deodorant. I use soap, deodorant, shampoo, conditioner, mousse, sea salt spray, heat protectant, dry shampoo, hair spray, face wash, face lotion, body lotion, anti aging cream, zit spot treatment, makeup primer, tinted moisturizer, concealer, powder, eyeliner, mascara, nail polish, nail polish remover, sunscreen and that's just off the top of my head. Is it any wonder that I'm the one who has the health problems? I've been slowly trying to either ditch or swap out my products for more natural options. I have a long way to go but I have made some significant changes. The first and easiest change I made was my body lotion. Despite the fact that I drink about a gallon of water a day, my skin still tends to be dry (thank you, desert living). I had tried using coconut oil as lotion before but found that it left me greasy yet, strangely, still feeling dry. 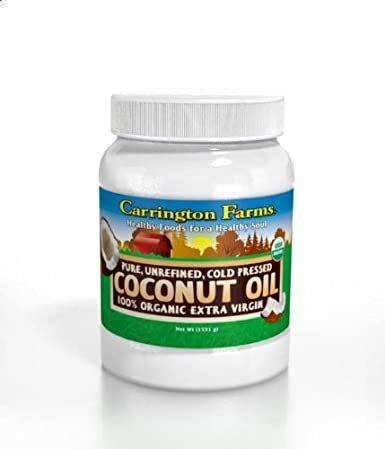 The coconut oil I've been using. I got it at Costco but it's also available on Amazon. One day, as I sat feeling greasy and weird, I remembered a method I discovered while pregnant with Baby 2 during an exceptionally dry winter. At the time, I did this with baby oil (don't do that) but it works even better with coconut oil. 1. Take a warm (not hot!) shower. When you get out, DON'T towel off. 2. Take a bit of (organic, unrefined) coconut oil and start slathering. Your pores will still be open from the warmth of the shower and the residual water on your body acts as a conduit for distributing the oil. You'll be surprised by how little oil it takes to moisturize your whole body. 3. Take your towel and gently dab off the remaining water. You'll be left with perfectly moisturized (non-greasy!) skin. Much of my makeup drawer is running low, which means it's time to start researching some other junk-free options. Does anyone have clean makeup brands they love? i LOVE tarte! their products are amazing. I use Everyday Minerals (everydayminerals.com). It's organic, vegan, cruelty free, no talc, etc. It's very reasonably priced and they have tons of products and colors. I've been using it for 6 years and I love it. I haven't really thought about the chemicals I apply to my body as much as I've thought about the chemicals I consume. It's interesting to think about. (I don't put very many chemicals on my body, though. I wear very little make up, minimal lotions and hair products, etc.) One thing to consider with hormonal and thyroid issues is how closely correlated they are to obesity. Of course thyroid issues and obesity can be a bad cycle, but there are LOTS Of hormone problems that occur for women who are overweight. So the increase in thyroid and hormonal problems might just as well be correlated with America's weight issues as well as our overindulgence in chemically products. Ooh, I'm excited for this series. Great tip, I'm gonna have to try it next time I shower! I also love Burt's Bees for natural body products. Coconut oil is a miracle worker! I am always amazed by all the uses just ONE product has! My entire life, my mom encouraged us to use only natural products on/in our bodies. (She's a legit hippie..) I've spent a lot of my life working on finding the right natural products for me. I've found that Whole Foods' 365 generic brand is pretty good. I use their standard, unscented body lotion as my face moisturizer and it works wonders! It's like $3 too, so yay. I will say though that the 365 shampoo & conditioner isn't great. It's cheap, but you have to use like 3X as much.. Haha. For a natural toothpaste, Tom's of Maine is great. As far as makeup, my mom is a "consultant" for a skincare and makeup company called Noevir. From my understanding, they sell natural skincare and cosmetic products. If you want more info about them, my mom is awesome and I could give you her info. I've used a few of their products and LOVE them. Like a lot. Oh, and I just have to say about deodorant - Ugh! I am at such a loss here.. I've used my mom's hippie stuff and it never has worked for me but I feel SO bad everyday when I put on my drugstore deodorant filled with toxins.. Sorry this turned into a novel, but I love talking about natural alternatives to everyday products, so feel free to message me or something if you want to talk more about it! I'd love to try this... but do you smell like coconut the rest of the day? I don't think I can handle the smell of the beach while snow is collecting outside my window. The E.L.F. brand at Target is very low on the hazard scale and it's cruelty free. The Cosmetics Database is a great resource. I also dig Physician's Formula organic mascara. Hey! I do this too! Coconut oil is the besssst. I've been experimenting with it on my face so I can post soon about the pros and cons I experienced. One thing I like to do is put it on my dry spots (nose and forehead) BEFORE showing so the hot water doesn't dry my face out and make it itchy. Just being in the shower usually washes off just the right amount from my house to just pat it dry with a towel when I get out and be good to go. This post makes me happy. Coconut oil users unite! Remember that time I said "house" when I meant face? Being in the shower does not, in fact, wash anything off my house. Also, I'm insane. I love doing this (Indians loooove coconut oil so we'd always bring back tons when we visited...weird then, cool now). I also make my own coconut oil deodorant. For makeup, I love pureminerals. It's a pressed foundation so it's not as messy as bare minerals and provides a little more coverage than tarte. Dan hates me when I complain about getting a zit because it happens about once every six months. I have a friend that buys her make up on etsy. Look up organic make up and go from there. I also love calendula. It smells awesome and it makes my skin feel so soft. I will be very interested to see what other products you recommend! Some of the natural products I use: Davines shampoo and conditioner and heat protectant, Marrakesh Oil deep conditioner, Alima Pure mineral foundation, Jane Iredale eyeliner, Avalon Organics body lotion, Juice Beauty oil-free moisturizer... I am still working on finding makeup, deodorant, and a facial cleanser, too. Looking forward to the rest of the series! I love stuff like this and I very much agree with you about the correlation between chemical exposures and rising rates of thyroid problems. I don't wear much makeup and don't put anything in my hair so I do not have much advice. I have a Pinterest page dedicated to non-chemical beauty products though and it is crazy how many of them use coconut oil. A long time ago you posted a link to homemade deodorant made with coconut oil and we use it everyday now! It's amazing, the only natural deodorant that has ever worked for me. Oh but apple cider vinegar as toner is amazing, my skin glows the morning after I use it. Ooh, great series - I love this topic! I don't use a lot of beauty products to begin with so I wouldn't be much help on the makeup front, but I do love Burt's Bees for chapstick, shampoo, etc. I love natural products, though, so will be interested to hear how this goes for you. It might take a bit of trial and error, but I'm sure you'll discover things that work well for you and your family. Good luck! i'm a big fan of coconut oil instead of lotion. been using it for over a year now. love it. anyway, sorry for the rambling, but yay for coconut oil! Coconut oil is also amazing for your hair if ou leave it on like a hair mask for a few hours before then washing your hair. I am so excited for this series. I do the baking soda/vinegar hair washing and it seems to work fine for me. Lotion, I don't know, I'm looking for something too.